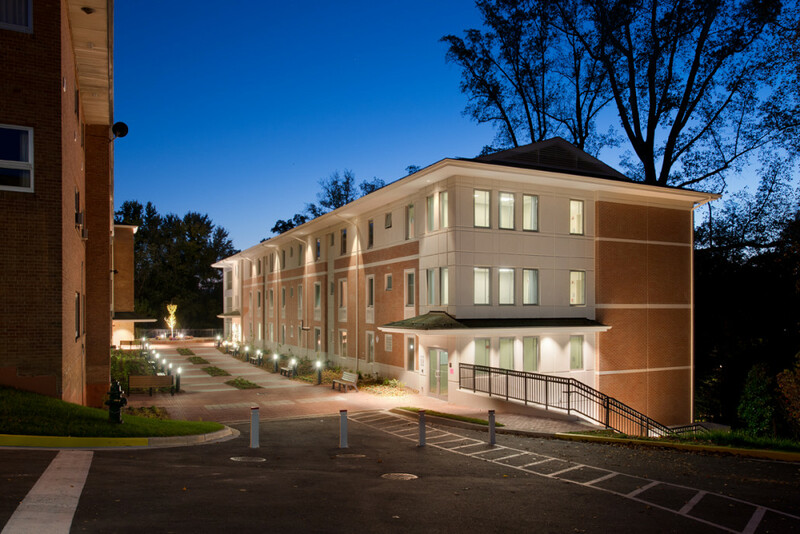 Washington, D.C. – Vantage Construction Corp. recently completed the construction of the Wesley Theological Seminary New Residence Hall. A design build 4 story tilt up dormitory with 78 beds, Common Area Kitchens and Lounges, Central Plant to support the new construction and tie-in of chilled Water Piping to the Campus Library and Trott Administration Buildings. Extensive Hardscape and Landscape improvements, Thin Brick and Special Coatings were utilized in the design to produce an institutional building that blended with the Wesley traditional brick and precast Architecture. Advanced Project Management was the Owner Rep/Construction Manager. Morgan-Gick McBeath and Associates was the project architect. Morabito Consulting Engineers was the structural engineer. Potomac Energy Group was the MEP engineer. AMT prepared the site plan. Vantage’s project team is being led by Dave Foley as the project executive. Leasing is being handled by CGR. More about Vantage Construction Corp.
Vantage Construction Corporation is a full service commercial general contractor operating out of Sterling, VA. We offer design-build, preconstruction services, consulting, and general contracting. Our target markets include Flex-Industrial Buildings, Low Rise Office Buildings, Retail, and Tenant Improvements. Vantage brings the experience and capabilities of a large company with the personal service and quality control of a small company. Contact us today about your next construction project at 703.752.4200 or build@vantage-construction.com.